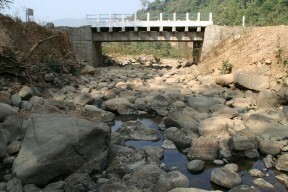 The Kyar stream is a tributary of the River Thandwe and natural habitat of this species. Pictured here during dry season. Like other members of the genus this species fares best in the company of its own kind. 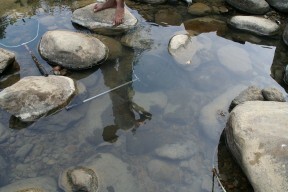 A closer view of Kyar stream. Probable pair with female above. ...home to a form of this species. Apparently native to Pakistan, India, Bangladesh, Myanmar and Thailand which is a potentially enormous natural range. Many of the older occurence records are probably cases of mistaken identity as this species certainly does not occur in Singapore or the Greater Sunda Islands of Borneo and Sumatra. Likewise reports from more southern parts of India such as Bombay, Hyderabad and the state of Karnataka are probably false. More recent records have tended to be from the Brahmaputra river basin in northeastern India and Bangladesh or various parts of Myanmar including Lake Indawgyi as well as the Salween, Thandwe and Ayeyarwady river drainages. 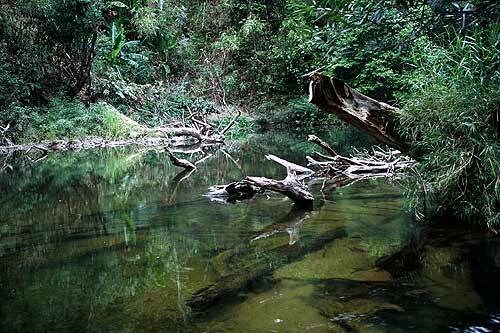 In Thailand it may be restricted to border rivers close to Myanmar such as the Songgaria, a tributary of the Khwae Noi (River Kwai). Considering the vernacular name records from the Ganges river basin are conspicuous only by their absence. 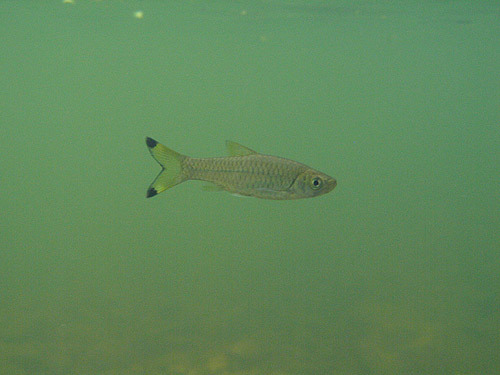 Little information is available but presumably it is a pelagic species inhabiting streams, tributaries and rivers. The Songgaria River in western Thailand, pictured above, houses a fish that appears to be this species and there the water is quite clear and flows at a moderate rate. 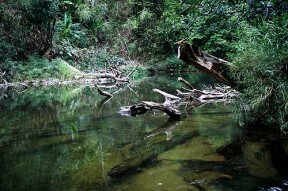 The substrate appears to be composed of rocks with fallen tree branches and there are submerged rocky outcrops around heavily-vegetated margins. 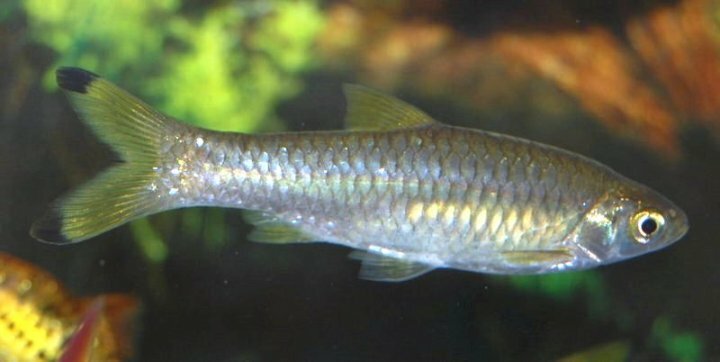 Sympatric species to be found in the river include Microdevario kubotai, Batasio tigrinus, Badis khwae, Tetraodon leiurus plus undescribed Rasbora and Schistura species among others. The largest officially-recorded specimen measured 5.1″/13cm. An active species and a group will need a tank measuring at least 48″ x 18″ x 18″/120cm x 45cm x 45cm/255 litres. Choice of decor is not as critical as water quality and the amount of open swimming-space provided. We suggest keeping it in a large, well-planted aquarium or alternatively it would look superb in a set-up designed to resemble a flowing river with a substrate of variably-sized rocks and gravel and some large water-worn boulders. A rivertank manifold could also be constructed to provide naturalistic unidirectional flow. The tank can be further furnished with driftwood branches and aquatic plants for aesthetic value. While the vast majority of the latter will fail to thrive in such conditions hardy species such as Java fern, Bolbitis or Anubias can be grown attached to the decor. In either situation the tank must have a very tightly-fitting cover as this species is an accomplished jumper and can escape through the tiniest of gaps. Like other members of the genus it is intolerant to the accumulation of organic wastes and requires spotless water at all times in order to thrive. Probably feeds mostly on invertebrates both aquatic and terrestrial in nature as with similar members of the genus. In the aquarium it will accept dried foods of a suitable size but should not be fed these exclusively. Daily meals of small live and frozen fare such as Daphnia, bloodworm and suchlike will result in the best colouration and encourage the fish to come into breeding condition. This species is very peaceful making it an ideal resident of the larger, well-furnished community set-up. It can upset slow-moving/much shyer companions simply by its size though and is therefore only appropriate for tanks containing sufficiently-bold species. 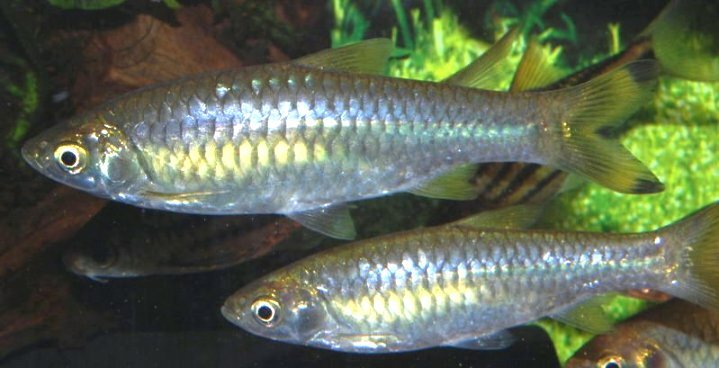 There are plenty of suitable choices including many cyprinids, loaches, cichlids, catfish and characins although as always when selecting a compatible community of fish proper research is essential. A community based around one of its native countries or river basins would also make a worthwhile project with some interesting alternatives. 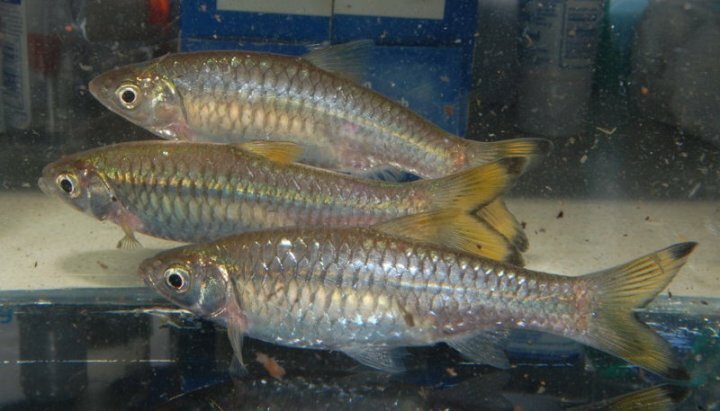 For example in the Ayeyarwady basin sympatric species include Acanthocobitis botia, Botia histrionica, B. rostrata, Lepidocephalichthys berdmorei, Danio albolineatus, D. choprai, Rasbora daniconius and Gagata gagata plus various members of Puntius, Devario, Garra and Schistura. This species is rarely seen in the trade and little has been written regarding its captive care. It’s possible that several colour forms may exist depending on collection locality.